You are here: Home \ Advice From Dr. Voyles: Floss, Floss, Floss! Flossing helps remove food particles and plaque between teeth that cannot be removed by brushing. It also helps prevent cavities and gum disease. Plaque that is not eliminated through brushing can harden into tartar or calculus. Flossing is not supposed to be painful. If it is, then you are probably flossing too hard. Incorrect flossing can harm your gums or the tissue between your teeth- but being too gentle may not remove the food and plaque. A feeling of discomfort is normal when starting to floss, but don’t let that stop you. Be patient and persistent. The discomfort will go away in a week or two, but if it persists, talk to your dentist. There’s a chance you could have a more serious gum disease. Flossing is for children, too. Floss your child’s teeth as soon as they have two teeth that touch each other. Continue to assist them as they grow older; they won’t be able to do it thoroughly on their own until they are 10 or 11 years old. A poll was conducted by Mouth Healthy in spring 2015, where readers were asked when they floss. The results revealed that 53% said they brush before flossing while 47% said they brush after flossing. Technically, there is no correct time for flossing. You can do it before or after brushing. What is important is you floss daily and thoroughly. Flossing should not be done hurriedly. Ensure that you have a couple of minutes set aside to ensure that you can do it thoroughly. 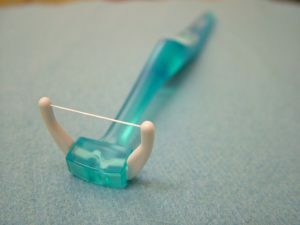 Using a strand of standard dental floss is just one of the many flossing options. Other options include using a pre-threaded flossers, a dental pick, a wooden plaque remover, water flosser or tiny brushes that pass between the teeth. Dental floss may be waxed, unwaxed, comfort or thick. Just choose what works best for you! Flossing your teeth once per day is recommended by the American Dental Association. Ask your dentist or dental hygienist to show you the proper way to use a dental floss.